To go your own way. To see no borders. To be timeless. To avoid clich�s. This is �Boom Beat�. This is their own way. Sometimes they call it �Psycho Active Ethno Industrial�. However there�s no aim to follow any known style. Its somehow conceptional music. If you use the word Experimental maybe you have a chance to define it. Sometimes you find elements of: Break Beat, Trip-Hop, Reggae, Avant-garde, World music, Ethnic Fusion, Dub, Industrial, Art Rock, Post Rock, Minimalism and Psychedelia.. Some say, that Sasha Pushkin�s voice sometimes reminds one of Tom Waits and Lou Reed. Always modern grooves. Always progressive sound. Always an emotionally loaded beat. Always a litlle unusual. Never colorless. It goes way off. With hot pepper! Electronic rhythms are combined with live percussion. Greek Tzura, or Ukrainian Domra with guitar, played by a wooden stick. 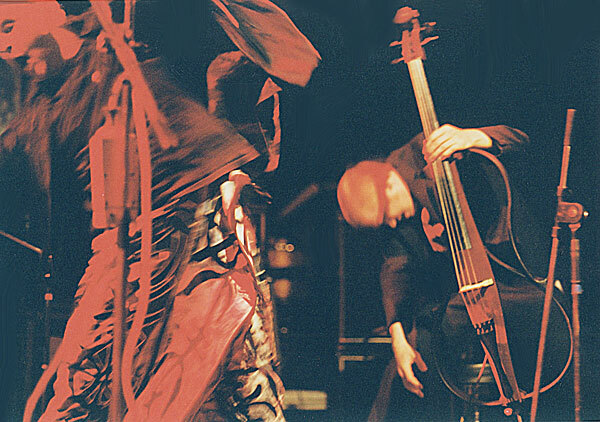 The electric cello with distorted voice. The beat is often made out of many short parts of normally long loops or out of mechanical and natural noise sounds. No limit of language. No limit of style. No limit on searching. No limit of length. No limit at all. The compositions can be anything between 3 to 15 minutes long. Experiments with a structure. No restrictions to verse - chorus - verse formats. Tightly composed parts combined with totally free improvisations. No limit of using acoustic or electric bass.� I just do something with bass drums and no one notices that there�s no bass at all� (Sasha Pushkin) Slowing down and speeding up instrumental lines simultaneously. Building a composition on dialog principal. Minimal tendencies combined with explosively eclectic parts. Harmony and dissonance. Putting together elements of different styles. Transparent arrangements. Mixing cold mechanic with warm emotion. Hidden massage. Intellectual and spiritual touch. Music for 7 shakras. Conceptually composed performance. Theatrical touches. Every musician is a visual figure in the field of stage light - projected atmosphere. Every composition is an audio-visual story, waiting to unfold. Sound artist and conceptualist. Tireless collaborator in different art and music fields. Transformable vocalist. Founder and creative source of Pushkin Boom Beat and many other projects. A charismatic stage presence of undiminished energy. A versatile veteran drummer from the Ivory Coast. 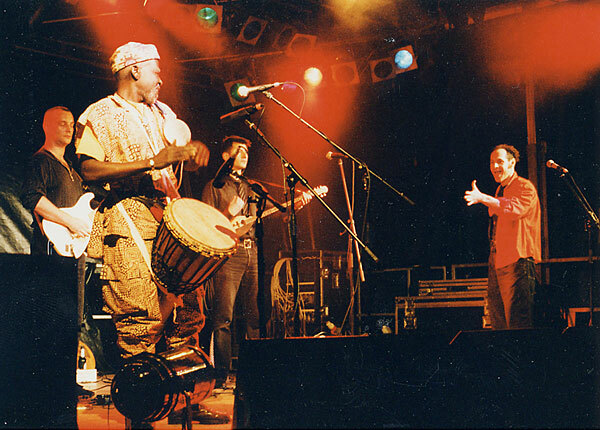 His beat has powered a legendary orchestra from Abijan and brought Alpha Blondy to the charts. 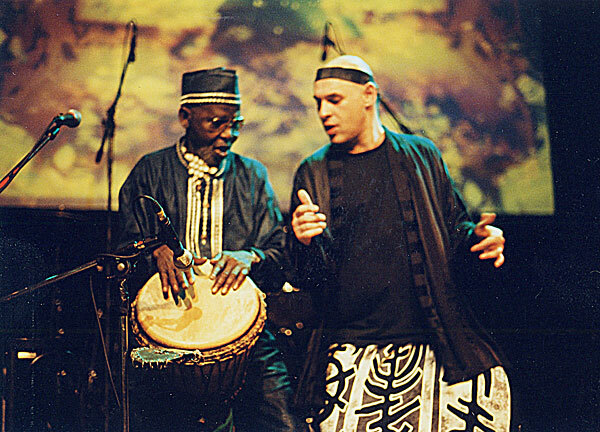 He worked with Manu Dibango and 1001 others. A founder of the Academy Percussion and grand patriarch of Berlin�s percussionists. A guitar player with a philosophical and explosive expressiveness. Known as a solo improviser and founder of the Gamelan - guitar sound. A world �Play�n Search� traveler throughout the USA and Finland, Belarus and Indonesia. Does not like to speak. The young and fresh generation power. Film and TV music composer. Solo performer and a founder of the �Blamk records� label. Multi-instrumentalist, can play any instrument known to man. Just watch him play. At the age of 12 Sasha formed his first �studio band� with school friends. Recordings were made in his parents` apartment, using the sounds of Piano, Acoustic Guitar, Suitcase, a portable cassette recorder and various found objects. He formed his second band at the age of 15. With a real Drum Set, Electric Guitar and a Russian electric organ. These improvised compositions sounded like a Russian Velvet Underground. In the same period he had his first �professional� trial - playing keyboard and piano with two of Russia�s future Rock legends, Viktor Tsoi (Kino) and his partner Sergey Timofeev. Unfortunately (or fortunately) the two singers fell out and the project fell apart shortly after Sasha became involved. Afterwards, Viktor Tsoi formed the group Kino, and Sergey Timofeev formed the Buratino group. There came a number of projects after that. 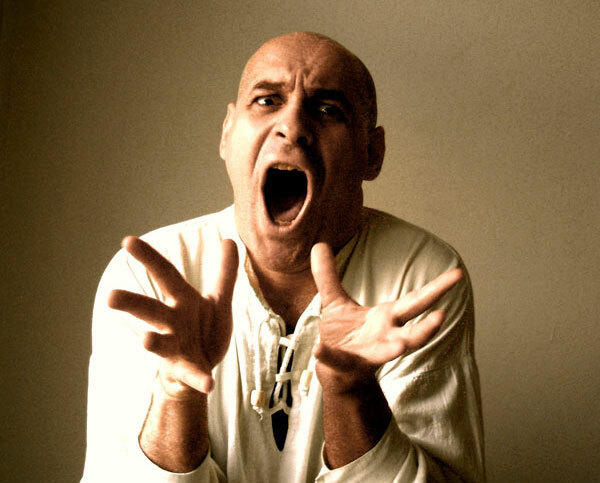 With a stage name �Alexander Spagetti� Sasha played by Buratino, Sosedi and Dva Samolyota. At age 22 he made many tours and performed stadium concerts as support act for DDT, a number one group of Russian Rock. They traveled around Russia, Ukraine, Belorus, Lithuania, Latvia and Estonia. In 1989 when his group was constantly on TV, Sasha Pushkin went to the west. He took part in many jam sessions with different musicians, making thousands of recording experiments and travelling around. He recorded and produced a CD�s by English Underground singer David Hull, Russian Folk singer Alexandr Kopanev. Guested on recordings by Hungarian Folk Rock group �Transsylvanians� and American experimental ballad maker Jeff Tarleton.. Later he worked as a guest singer and soundman with Berlin�s Russian Folk Rock legend �Apparatschik� and Ska Band �Blechreiz�. He played the role of frontman of their common project �Skazdrovje� in front of 7000 people in Rudolstadt and 3000 people in Berlin and worked on their CD productions. 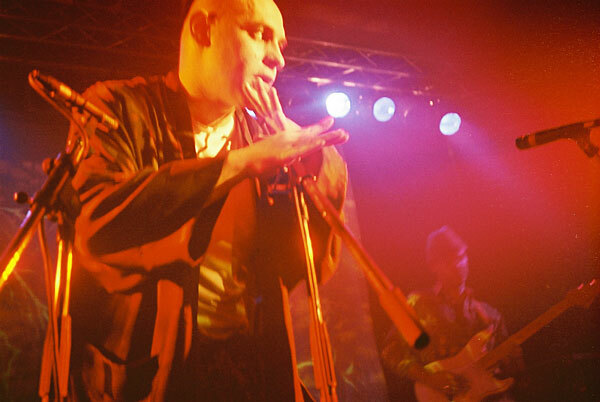 In 1998, in spite of much success Sasha stopped the �PUSHKIN� project, and formed the new �PUSHKIN BOOM BEAT� to explore his experimental electronic, Rock and ethnic sound ideas. In 1999 he created �PUSHKIN FUNPLUGGED� as an outlet for his �Russian fun� ideas. 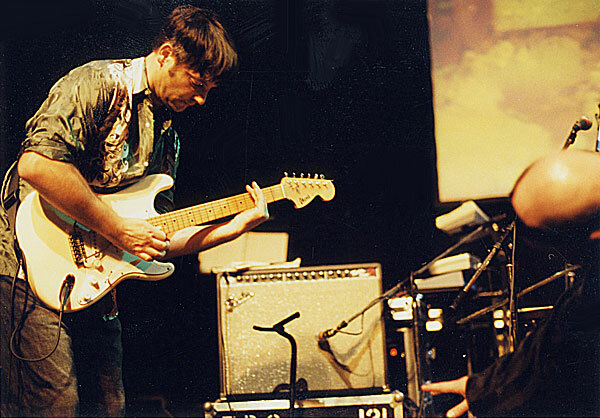 By 1998 there were just 4 musicians and machines on stage. The the new face of Boom Beat - more unusual, more electronic, more conceptual and modern. In 1999 PUSHKIN BOOM BEAT made a new recording and Sasha Pushkin makes the photos for the cover in Greece and Switzerland. It had to be something special. The next year, Rubel Records label (a representative of Russian Experimental Rock legend in Germany, the �Aquarium� group) becomes a production partner. At the end of 2000 in Berlin they were fortunate in experiencing a CD - release of their work - a 5 hour long Multi-media Mystery show with 40 participants, (performances, slide and video projections, special space dividing constructions and 15 musicians at the same time on the stage jamming with the DJ) Like yesterday and today and tomorrow the group constantly plays the same, but ever-changing �Boom Beat� sound . Ihre Musik heisst "Boom Beat" oder "Psycho Active Ethno Industrial" und schwebt in einem unentdeckten Grenzbereich zwischen Parodie und Ernst, U - und E-Musik. Die vier energiegeladenen Musiker f�llen die minimalistisch-mechanischen Rhythmen mit einem theatralischen Freistilmix voller Sehnsucht und Musikalit�t. Boom Beat erschafft einen abenteuerlicher Klangraum, in dem sich gesampelte arabische oder industrielle Rhythmen mit dem Offbeat einer griechischen Zura oder Elektronik Cello und afrikanischer Konzeptualit�t treffen, um gemeinsam im West-Ost-S�d-Nord-Groove abzuheben. Die Musik von Pushkin Boom Beat ist so kompliziert und einfach wie ein Zahnrad, das sich ohne Eile in das Fleisch unserer modernen Musik schneidet. Sasha Pushkin, das Multitalent aus Sankt Petersburg, komponiert und textet, arrangiert und ist durch seine expressive B�hnenpr�senz und seine extrem wandlungsf�hige Stimme ein idealer Frontmann. Seine Stimme rappt und toastet, er singt manchmal russisch-melancholisch, manchmal laut und b�se. Aber immer mit Pfeffer. Pushkin spielte sich im Rahmen des "Potsdamer Abkommen" und beim Berliner "Bands United" - Festival in die Herzen des Publikums - und der Medien. Da� in seiner Band auch Musiker von Apparatschik und Blechreiz spielten, wundert nicht: mit beiden Bands gab es schon umjubelte Auftritte. So im Berliner SO 36 und im Pfefferberg, Tempodrom, Haus der Kulturen der Welt ..., so auch als Headliner des Abends vor 7000 begeisterten Zuschauern beim Tanz- und Folkfestival Rudolstadt. "Wann h�rt man wieder was von Euch?" war Backstage die meistgestellte Frage. Hier ist die Antwort: "Jetzt!" Boom Beat ist inspiriert durch ... Trip-Hop und Post Rock, Worldmusic und Rap, Reggae und Avantgarde � und zwar zusammen! Mit eigensinniger Stilistik durchbricht Boom Beat die die Grenzen des modernen Popsongs... und zwar heftig! Boom Beat benutzt ... Maschinenloops, Talking Drums von der Elfenbeink�ste, Guitar, Objects, Seiteninstrumente S�d und Osteuropas, Pantomime und Stimme... und zwar zum grooven! Boom Beat ist live ... Nicht erfunden. Geht richtig ab. Es macht Spa� zuzuh�ren und sie zu sehen ... und zwar immer! S. Pushkin ist inspiriert von Brian Eno, David Byrne, King Crimson, Tom Waits, Nina Hagen, David Sylvian, 23 Skidoo, Madness, Ministry, Aquarium, Harry Parch, Peter Gabriel, Residents, Zga, Tom Ze, Asian Dub Foundation, Transglobal Underground, Photek, Bj�rk, Urban Dance Squad, Reggae und Dub, russischer, afrikanischer und orientalem Folk, Moderner Klassik und Free Jazz. Sound K�nstler und Konzeptentwickler. Ein unerm�dlicher �Kollaborateur" in verschiedenen Feldern der Kunst und Musik. Gr�nder und kreative Quelle von Pushkin Boom Beat und vielen anderen Projekten. Er verbindet eine charismatische B�hnenpr�senz mit scheinbar unersch�pflicher Energie. Ein versierter und wandlungsf�higer "Trommel-Veteran" von der Elfenbeink�ste. 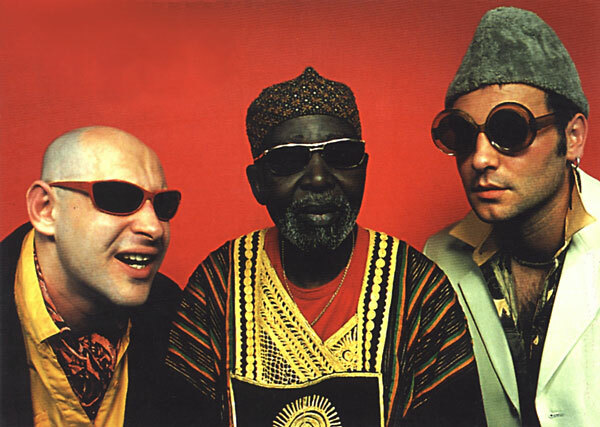 Sein Beat hat ein legend�res Orchester aus Abijan angetrieben und er brachte Alpha Blondy in die Charts. Er arbeitete mit Manu Dibango und 1000 anderen. Der Gr�nder der Academy Percussion und der "Patriarch" der Percussionisten Berlin�s. Die Kraft der neuen Generation. Vielfachtalent. Expression und Humor. Filmmusikkomponist. Man sollte Ihn sehen! "Ich war sehr beeindruckt ... ungeheure Kraft ... �u�erst interessante Arbeit... unglaubliche Dinge geschehen ... progressiver Sound ... bedeutsamer Ansto� aus Berlin... "
�Absolut einzigartiger Stil ... etwas nie zuvor geh�rtes erscheint ... unnachahmliche Technik ..." �Postmodernes Schamanentum auf der H�he seiner Zeit." �Der Virtuose Pushkin wirkte wie ein an die Spitze st�rmender Showmaster ... Nach den ersten Paar Takten war die Halle zum bersten voll ... und kein Einziger verliess den Raum vor dem Ende ..."
Sasha Pushkin sang einen "Raggamuffin-style" der manch einen Jamaikaner �bertroffen h�tte ..."
"Live mu� es unglaublich sein !"